Social Fresh was highlighted as a great Cover Page graphic for its simplicity. Thumbnails for Apps can be customized for editorial impact. Text can work as well as images for creating interest. Yesterday I treated myself ( yes, a webinar can be a treat! 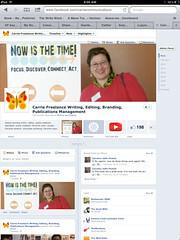 ), to Amy Porterfield's Facebook Timeline webinar. While from time to time I can certainly say I need a little break from all things Facebook, I had been reading so much about the new features of Timeline, and starting to some pages that really stood out, that I felt an overview was in order. And being the Admin for several Pages of course means that I need to keep up with the latest changes. With just over 1,000 people in the call, clearly I was not alone! Amy did a great job highlighting the key features of the new Facebook for Pages Timeline, emphasizing Strategy over tools for their own sake, which is true for any social media platform. The slidedeck is coming soon, so I will post that as well when they're ready. In the meantime, here are my top 10 takeaways and some screenshots of the highlights. Use your new Cover photo to create interest and promote your brand or an element of your brand. Do not use for offer or sales. Good examples are: Social Fresh, Captain Morgan Brandy, Dove, Spark Curiosity. Cover dimensions are: 851 x 315 pixels. Graphics that don't fit the dimensions will appear blury or out of proportion. Tabs are now "Apps." Use Apps to create a mini website and keep people in your FB page. You can use blog posts, publications, enews sign up, etc. all to create interest in your page. You can Pin or Highlight an update and that increases the width across the length of the page. Use Milestones to enter important Business Events relevant to yours niche, and then link with web pages, products, or specific areas of your website. For example, I have the exact dates I received the Constant Contact Allstar Marketing Awards, as well as the date I published my first feature in Redbook, and landed my first business client. I'll be using those to tell my story when I work on my Milestones. It’s no longer about the # of Likes, it’s really about the Leads. Amy recommended Lujure for drag and drop features. I had heard of Lujure before, and will be trying it out soon. I like that it's an entirely drag and drop platform with no coding needed. A free account gets you 2 custom tabs, and the price goes up from there, with $30 a month giving you significantly more features. I'll be experimenting with Lujure and a new app I found called Tabsite, which offers similar drag and drop features. Pay particular attention to the 4 main "Thumbnails," or Tabs, that appear on your main screen, as these are your prime real estate for creating interest in your business. The Photo tab is the default and can’t be moved. You can change the order of the tabs by clicking on the Tab drop down menu, select "Change Order With," at the top, and the select the tab or app you want to to change the order of. Take advantage of the variety of apps, or tabs, to collect email names. You can, for example, use a tab to highlight a blog post and then add an email sign up at the bottom. As Amy said, and I tweeted, anyone who reads through your entire blog post should be on your e-list!. Use FB Ads to link to specific areas of your website, or to books or products you have created. You can Pin or Highlight posts, which will then fill the width of your page. Also, if you're a Constant Contact user, they posted a great blog recently on Timeline tips and how the new user interface is compatible with their new Social Campaigns program. Here’s my page with some of the changes. Have you converted over to the new Timeline for your business yet? Feel free to add your tips in the Comments.